Betty J. Dean, 80 of Bradner, Ohio passed away Friday, February 1, 2019 at Bridge Hospice, Bowling Green. She was born Betty Jane Roberts on December 14, 1938 to Harley Leroy and Minnie Elizabeth (Evans) Roberts in Bradner. 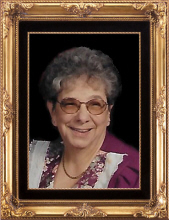 In addition to raising 4 children, Betty, worked in numerous jobs in her life, the most notable were with Ottawa Rubber in Bradner as a mold operator and with Lear Industry as a press operator. In her free time, she enjoyed crocheting, reading and making ceramics, she also loved to play euchre. It was in her later years that she spent more time with computer games and watching her favorite television programs. However, it was still her family that brought her the greatest joy. Betty is survived by her children: Cathy (Tom) Dean of Portage, Steve (Sandy) Miller of Bradner and Tammy Warnement of Fostoria, 11 grandchildren and 13 great-grandchildren. Betty was preceded in death by her parents, infant daughter: Carla Miller, son: Rex Miller, great-grandson: Dalton Burnett, 6 sisters and 5 brothers. Family and friends will be received 10 a.m.- 12 p.m., Wednesday, February 6, 2019 at the Marsh & Marsteller Funeral Home, 4094 State Route 105, Pemberville, OH. A funeral service will be conducted at 12 p.m. in the Funeral Home with Pastor Dan Horner, officiating. Interment will be in the Westwood Cemetery, Woodville, OH. Memorials may take the form of contributions to: Bridge Hospice. On-line condolences may be shared with the family at www.marshfuneralhomes.com. To send flowers or a remembrance gift to the family of Betty J. Dean, please visit our Tribute Store. Officiating, will be Pastor Dan Horner. "Email Address" would like to share the life celebration of Betty J. Dean. Click on the "link" to go to share a favorite memory or leave a condolence message for the family.